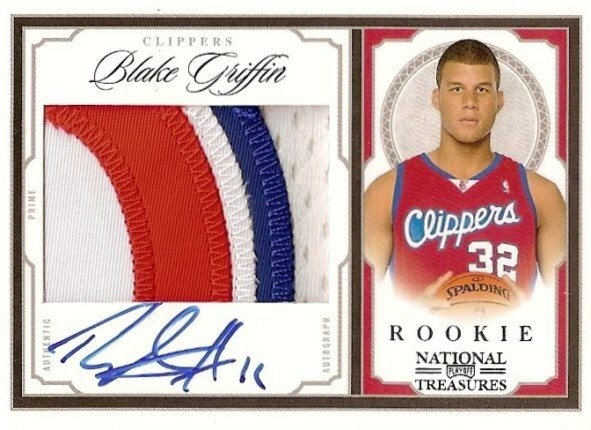 All About Sports Cards: Blake Griffin is the unanimous selection for the 2010-11 NBA Rookie of the Year. Blake Griffin is the unanimous selection for the 2010-11 NBA Rookie of the Year. Blake Griffin of the Los Angeles Clippers, who's rookie cards, including the one pictured above, have been some of the hottest auction items lately and is the newest signed exclusive Panini athlete, has just been voted the 2010-11 NBA Rookie of the Year. Griffin is the first unanimous Rookie of the Year selection since David Robinson in 1989-90, receiving 118 first-place votes for a total 590 points. The only other rookie to even come close to Blake Griffin was another player who is exclusive to Panini, Washington's John Wall who finished with 91 Second and 22 Third place votes for 295 total points. Players were awarded five points for each first-place vote, three points for each second-place vote and one point for each third-place vote. Griffin, who was selected first overall in the 2009 NBA Draft but missed the entire 2009-10 season due to injury (stress fracture, left knee), recorded a rookie-and team-leading 22.5 ppg (12th overall), 12.1 rpg (fourth overall) and 63 double-doubles (third overall). He was the only player in the NBA to average at least 20 points, 12 rebounds and three assists. Griffin became the first rookie to average at least 20 points and 10 rebounds since Elton Brand (20.1 ppg, 10.0 rpg) in 1999-2000; and he was only the fourth rookie to total at least 1,600 points, 900 rebounds and 250 assists, joining Kareem Abdul-Jabbar (1969-70), Elgin Baylor (1958-59) and Sidney Wicks (1971-72). A six-time T-Mobile Western Conference Rookie of the Month selection, Griffin became the first rookie to appear in an NBA All-Star Game since Yao Ming in 2003. Griffin also participated in the T-Mobile Rookie Challenge and won the Sprite Slam Dunk contest. On March 23, he recorded the first triple-double of his NBA career -- 33 points, 17 rebounds and a career-high 10 assists in the Clippers' double-overtime win over Washington, becoming the first rookie to record a triple-double of at least 30 points, 15 rebounds and 10 assists since Jerry West did it on Feb. 26, 1961 (38 points, 15 rebounds, 10 assists).